Snow lay thick, too, upon the roof of Willoughby Chase, the great house that stood on an open eminence in the heart of the wold. But for all that, the Chase looked an inviting home – a warm and welcoming stronghold. Its rosy, herring-bone brick was bright and well-cared-for, its numerous, turrets and battlements stood up sharp against the sky, and the crenellated balconies, corniced with snow, each held a golden square of window. The house was all alight within, and the joyous hubbub of activity contrasted with the sombre sighting of the wind and the hideous howling of the wolves without. Fiction or non-fiction? Genre? Children’s fiction; alternative history with a Gothic atmosphere. The book is set in an alternative 1832: the difference between the world of the The Wolves of Willoughby Chase and ours is that King James II was never deposed, and James III is in the throne. Also, after a series of severe winters, wolves migrated through the Channel Tunnel from mainland Europe to Britain, where they are widespread at the time of the story. What led you to pick up this book? I was reading through an encyclopaedia of children’s literature, and it mentioned that this was a classic that shouldn’t be missed (it was first published in 1963). It sounded good, so I took note of the author and title and ordered it a few weeks later. Summarize the plot, but don’t give away the ending! So, as I said, the book is set in 19th century Britain. Bonnie and her parents live at Willoughby Chase, but because Bonnie’s mother has been unwell, her parents are to leave her with a governess and travel to Southern Europe for six months. They ask Bonnie’s orphaned cousin, Sylvia, to come stay with her, and hire a distant relation, Miss Slighcarp, as the girls’ governess. But Miss Slighcarp is not what she appears, and the day Bonnie’s parents leave, the girls realize they’re in trouble. What did you like most about the book? First of all, I liked the atmosphere. A manor house! With secret passages! And wolves howling outside! And villainous villains within! Secondly, I liked that it was just such fun to read. It reminded me a little of Lemony Snicket, only not so over the top (and yes, I realize the point of Lemony Snicket is being over the top). I liked that it questioned gender and class assumptions. And I loved Bonnie and Sylvia. But I see a question about the main characters, so I’ll save it for that one. What did you like least? I guess most of what happens in the story is easy to see coming, but this bothers me less if the book is an older one, as in this case. I always think the plot was probably fresher back then. Also, although Bonnie and Sylvia are well-rounded characters, the villains are a bit one-dimensional. And finally, the historical setting isn’t always believable – for example, Bonnie and Sylvia have a lot more freedom than young girls of their social class would have back then. But honestly, I was having too much fun to really care. Have you read any other books by this author? What did you think of those books? I haven’t yet, but I plan to. This book is actually part of a series, but while they all share the same alternative history setting, they can be read independently. What did you think of the main character? I loved them! Both Bonnie and Sylvia are smart heroines who know how to look after themselves. Bonnie is quick-tempered, while Sylvia is more sensible, but they were both equally likeable in their own way. What about the ending? I was satisfied with the ending. It really isn’t a spoiler to say everything turns out okay, because this is a book where you can tell it will from the very start. I have read several of the books in this series, and my wife has read them all, I believe, and we love them. Atmosphere is a good word because these stories definitely have that in spades. I'm glad you enjoyed it, it is a really fun read and a really fun series of stories. Great way to do the review! I may have to use this myself, especially when reviewing something read a little while ago. I picked up a book by Aiken at a library sale recently, I think it was something like Whispering Mountain? I hadn't looked much at it, but might have to after this review. I don't mind when children's books are a little predictable. They aren't written to keep an adult in the dark, you know? So I let that go when I read children's books. I was really sure that I had read this,but after reading your review I think I might have picked it up from the library but never actually read it. I am terrible for remembering books that I have read. I will have to look this book up. I am also interested in the encyclopedia of children's literature too, didn't realise it existed. It is such a long time since I read this, but it is nice to read about it again. Like the review questionairre! I like the review questionnaire too. What a great way to be reminded of a book you read a while ago! It's these types of books that make me wish my childhood was like that-- crazy adventurous, secret passages, evil adults, etc. The book sounds good! Maybe the plot wouldn't be so obvious to kids. Another wolf book! My daughter will love it. Thanks for the recommendation. Sounds fun! Maybe one to read with my daughter. I read this when it was first published and yes, I think the plot did seem fresh and original then. She has influenced a generation of writers since. I like many of her other books including the adult ones - she wrote a couple of Austen sequels before it became fashionable to do so, and some that fit into a sort of gothic romance genre. There was also a fun children's series about a girl called Arabel with a very unmanageable pet raven. You've made me want to rediscover them all, Nymeth. Oh I love Joan Aiken. 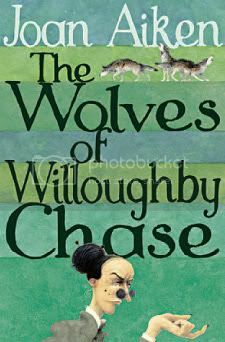 The Wolves of Willoughby Chase is one of my favourites. I remember a scene near the beginning, on a train being attacked by wolves...so deliciously Gothic. Joan Aiken has this way of distorting history - the places and situations are familiar, but then you realise something is very wrong indeed. My absolute best is "The Stolen Lake". She also wrote some sequels to Jane Austen's novels. I like those too, but in a different way. They are real curl-up-in-bed-with-chocolate books. I always get slightly worried when there is a classic book that I've never heard of. As in, "How many books out there are so great to stand the test of time and I've never even given them a passing glance?!" So glad you picked this one up and that it was a good read. That sounds like a good one for Carl's challenge! I also came to this book as an adult, after seeing it on some list of classics. We had it out of the library last summer and after I read it, my 15 and 12 year old kids read it and enjoyed it too. It sounds good, and I liked this set up for your review! I'll have to check it out. I've got this one on my tbr pile so I must get to it. I didn't realise it was that good! Nymeth...I think you liked the book for the most part. I told you when you were going to read it I thought you would like it. I remember reading it when I was teaching 5th grade. On a scale of 1-5....What do you think? Just curious it you will read any more of her books. I really enjoy how you pick out books that are sitting on my library shelves right now....I'm going to have to read this one during the upcoming school year. But until I do I will be recommending it to many students!! Thanks Nymeth for a great review! This sounds lovely! I will have to check it out. The plot sounds a little familiar; I can't remember where I read about it before. But it sounds like a really great book. I'm so glad you liked this! I read it when I was a kid, and I think I really missed how funny it is. "Oh, Bonnie! Wonderful cheese!" is a big joke in my family - it is a bit over the top. I never liked another Joan Aiken book nearly as much as this one. This sounds like such a fun read. Thanks for sharing your thoughts on it! Claire: I think Dewey would have liked for it to continue to be used. It really comes in handy when one can't quite remember the details of a book! Amanda: I actually expect as much of children's literature as I do of books for adults. And the best ones do deliver! But in this case, the book being older is enough for me to "forgive" it. Vivienne: There are quite a few, actually! I can't remember the title of the one I was looking through, but I loved that it had illustrations. Verity: As I was telling Claire, Dewey always encouraged people to use it, so feel free to grab it! Andreaa: You're most welcome! I love me a good atmospheric read as well. Kathy: I guess that there's the fact that they haven't had time to read as much as adults have yet, so everything must seem a little newer. GeraniumCat: It's as I suspected, then. And I definitely want to read more of her work! An unmanageable pet raven sounds excellent to me. Masha: That scene had loads of atmosphere, though I confess I felt sorry for the poor wolf :P And I really like what you said about distorting history. Aarti: I know! I always feel the same. Becky: Glad you liked the format! And I hope you enjoy the book. wisteria: The reason why I don't use ratings is because I have a really hard time translating my feelings about a book into a number. They're so complicated! If I did I'd have to use different scales for theme, writing, plot, characterization, atmosphere, originality, etc :P I did like it a lot, though. Like I said, even the things that could be perceived as flaws didn't bother me at all. And I will definitely read her again! Hazra: Maybe you read it when you were little? Or, like GeraniumCat was saying, maybe it's just that she influenced so many writers. Trish: I guess 3-4 is the average, but it really depends, and yeah, I usually have a backlog of posts to use. For example, I spent this whole week reading The Children's Book by A.S. Byatt, but I still have some from the week before to post about. And now I'll probably read 2 or 3 short books so I can feel productive :P And I love it too...I don't want us to ever stop remembering her. Jenny: I forgot to mention that in my post, but yes, the humour was wonderful! Sam: Tis what I'm here for :P It really was fun. Susan: I love saying the title too :D This was my first time reading her, but I can tell by the fact that she did atmosphere so well in this one that her ghost stories would be excellent! Alice: It makes things easier, doesn't it? Hey Nymeth....I actually understand that you don't like ratings. I don't like them myself. I have only recently used them since I have noticed so many bloggers using them. I totally agree with your premise about deciding on a rating for a book. That is one reason why I never give a rating below a three. If it is a book lower than that I just don't write about it. My love of reading is so intense that I usually find a wide array of feelings for the different elements of the book, plot, characters, style, writers craft, setting and what I call appeal. (General appeal to me is subjective). So I think, I will continue to go with my gut and eliminate the ratings as I used to do, as I think my reviews speak for themselves. Please email, I'd like to talk. sounds like a really fun book for kids- thanks for the great review! great post! this does sound like a fun book. I loved this book when I was younger. I'll have to re-read it. Thanks for the review. I read this as a kid and really enjoyed it along with the version they did on the TV. I must re visit it at some point as an adult and see how it holds up. I don't remember much except that it was quite gritty. I read a lot of Joan Aiken books when I was younger, although this one doesn't sound familiar. I love that cover! You've convinced me! I really will have to pick this up now. Wisteria: I'm glad we had the chance to talk about this! Rhinoa: I think it holds up pretty well! Belle: I love it too! Very appealing. Ladytink, hope you enjoy it!